Super Sculpey was created to answer the need for a polymer having the workability of Sculpey/Polyform with more strength. It is a translucent Pink Beige color only and bulk packaged. Conditioning is easy, just knead it a few times and it's ready to use! As it shares the same great capacity to take and hold detail, it is extensively used by artists making both fine art original sculpture and the original prototypes which are later then molded and cast in resin, etc. Due to the translucent quality, this clay has found a home in the world of fine art doll making. Once cured, this clay retains a soft translucent and matte finish. Like Sculpey/Polyform, Super Sculpey can be painted after curing. Once again, acrylic paint will yield the best result. Oils can also be used providing the surface is glazed prior to painting. tip: When creating sculptures, the thickness of the sculpture should be no greater than 3/4 inch. A thickness this great creates problems when curing; the outside of the sculpture will cure while the inside will remain uncured; your work may crack. To solve this problem, make an armature of wire and aluminum foil to which a uniform sheet of clay will be applied and detailed. Should you have a problem with a crack, while the sculpture is still warm, press clay into the crack, blending it onto the sculpture surface, then bake for an additional 15 minutes. Super Sculpey can be added to the stiffer polymer clays for easier conditioning. : bake in a pre-heated oven 275� F ( 135� C ) for 15 minutes per 1/4� thickness. : bakes to a ceramic like finish. : Polyform has a new Super Sculpy for dollmaking, as the original Super Sculpey was never intended to be a final product. It was intended for prototypes of molded shapes. Two years ago they sent a rep to NIADA and responded to user frustrations with a test group of artists. A new Super Sculpey is now in ASTM testing, however, you can get it in 25 pound bulk pack by phoning Hope Phillips at 708-427-0020. 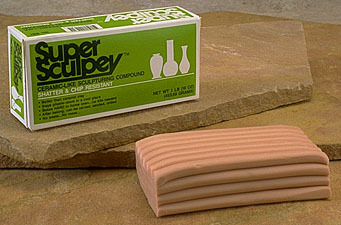 Be sure to ask for the new Super Sculpey for dollmaking. They will ship COD. It is not available in stores yet.